Staff motivation has always been an issue for companies both big and small. Most of us would both prefer to be somewhere else and be doing something else other than working, so companies offer bonuses, additional employee benefits and other incentives to get us all to work a little bit harder. Wearable tech has given rise to a new wave of devices capable of monitoring how an employee is performing throughout the day. These devices work by keeping track of a person’s well-being, hence building up a biological profile detailing when an employee is at their best, and when they’d be better off enjoying a ‘duvet day’. This process is being called ‘human optimisation’, and has already been used by top sports teams and athletes all over the world. This process, by which it is made sure that elite athletes are in the best condition possible ahead of the next big event or tournament, has begun to interest top companies from all over the UK. Dr John Coates is a fellow at Cambridge University who specialises in neuroscience and finance. He says he is now receiving weekly calls from firms who have noted his work on the effects on both physical and mental well-being due to risk taking, and hope to apply his findings across their workforce. So far, companies that have used wearable tech in the workplace have largely focused on matters such as improving efficiency and workplace safety. 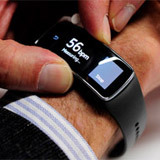 It is hoped that new gadgets would give companies the ability to link physiological data with the level at which their employees are performing. This would prevent employees from working in stressful environments or from making important decisions when they are feeling low. The most interested companies are those that exist in high-risk sectors, such as finance. In these environments, employees can find themselves under huge amounts of stress. Bad decisions have the potential to cost companies millions of dollars. If a key decision maker – such as a trader or a broker – can be warned via wearable tech that they are not currently physically or psychologically right, it may prevent them from making costly mistakes. Some suitable wearable tech devices are already on the market. The company Equivital markets a chest band that monitors multiple indicators – including heart rate and skin temperature. It seems likely that one day soon such monitors will form part of a company’s dress code, as much as a smart shirt and a suitable tie.